He grew up in a home full of Omega Workshop objects, before being evacuated to New York during the Second World War where he was introduced to the Museum of Modern Art. 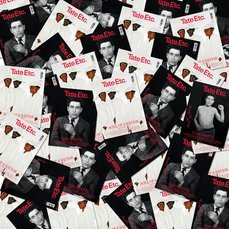 Ever since then, for the artist who represented Britain at the Venice Biennale in 1984, and was an early recipient of the Turner Prize in 1985, memory has played an important part in how he articulates his world. It’s always seemed to me that most of our contact with paintings – for those who are not painters – is in memory. I spend much more time remembering pictures than looking at them, except for a couple I own. There’s a quality in your work of meeting the viewer half way in this regard: the memory themes are not merely private, but have to do with a condition of reception that’s not widely acknowledged in contemporary painting. Does that sound right to you? Yes. I think it’s absolutely true of some artists I admire above almost everyone else, because memories are what we share. Degas, for example, is someone that, in an odd way, I feel very close to. I don’t say that in any hubristic sense. The things he observed became almost instantly things that had happened. And so he would go on re-using them, tracing and transferring images or parts of images from one work to another. What that makes me think of is something very different from and ostensibly unconnected to Degas, which is Abstract Expressionism. It was supposed to be about the painting process as an event, making the painting something that happens. And yet one does not think of the Abstract Expressionists in relation to Degas. They’re much closer to you than to him in terms of the open stroke, brushwork or marking that advertises itself for what it is. But he used that a lot as well, particularly in the monotypes, which are so marvellous. I think there is a connection between those apparently disparate situations, because the Degas pictures are always things. They became objects. Ah, a wonderful picture! That’s completely a thing. He’s turned something that was observed into a pictorial object – like a piece of architecture. And how is that different from someone such as Chardin, some of whose pictures appear to be as carefully, though not as coldly observed as The Bellelli Family? Well, I don’t think of The Bellelli Family as being coldly observed at all. I think it’s a total work of art that he was extremely passionate about. I can’t see any fundamental difference between that and The Owner’s Birthday, his monotype of some of the girls patting the brothel-keeper on the head. His formal passion has been turned into a very solid thing. And you see yourself enacting a similar process in your work? Absolutely. Not even you would I allow to see an unfinished painting. Well, that’s not quite true. Last time I was here you allowed me to see two unfinished paintings. I did? I never normally let anyone see unfinished pictures. Yes, I remember now, and you said you had no idea my paintings were so subject-led. I still don’t understand the status of the subject in your work. At times it seems that a title will bring a subject forward, so it becomes a shareable thing to contemplate. In other cases, before one knows the title, your pictures can seem not exactly abstract, but disinterested in subject. Whereas your response to my question was a passionate commitment to subject. Absolutely. The subject is what the painting is about. I think that’s the best I can do. So a painting such as First Light on account of its title suggests an image. If you had called it Untitled, Number 18, 2005, I might certainly have seen emanations of light in it, but I wouldn’t have taken it to have a subject. No, well, some are more literal than others. So when they’re less literal, they’re not more abstract? That’s where I’m confused, because I don’t see how you can have a shareable subject without some literalness. In this case, the literalness comes mostly in the title. But it seems as if there’s a way of seeing these things that you insist upon for yourself that you can’t insist upon for the viewer. I can’t control the viewer. But I tell them what the picture’s about, always. I’ve never painted an abstract picture in my life. I can’t. But there’s so much verve and assertion in the brushwork here that to my eye it overcomes the subject. You’re looking at paint first and last, really, even though it’s paint inhabiting a situation you’ve constructed. I think it opens itself to an abstract reading. Well, I was brought up in a period when art historians talked about the formal structure of paintings such as Rogier van der Weyden’s Deposition c.1435–40, where the subject was often taken for granted and could be read as abstract. But we’re no longer in that situation. The subject cannot be taken for granted. No, we’re not, nor any longer can painting be taken for granted. But all paintings that have lasted have had to be able to be looked at as physical objects as well as what they’re about. Anybody who’s seriously interested in painting views pictures as things as well as images. Then it seems that a certain kind of transaction between these points of view – seeing it as a thing and as an image or construction – is breaking down. Breaking down with the audience? I see why you say that, but it’s not been my entire experience. I was amazed when I had my show at the Metropolitan Museum. Retrospectives are almost the only time the artist meets his public, or when there’s any dialogue. I had the most extraordinary encounters in New York. I thought ‘nobody’s going to understand what my pictures are about at all’. But they did to the most astonishing extent. When one sees in your paintings what looks like a painted frame, or a reversed panel, does that imply a revision of something that already exists or existed? For me, it’s got to be a new beginning. I’ve never been able to paint in series either, unfortunately. No. Before anything else can happen, I’ve got to establish the physical reality of the picture. And it’s when that physical reality is established that the subject can begin to show itself ? I would think that from the naive non-painter’s point of view, the trick would be to surmount the physical reality of the panel with paint – to make it disappear as mere matter – rather than achieve a peculiar physicality with the paint. The physicality is the paint and the panel, together. That’s what has always fascinated me about Arshile Gorky’s work. He is the most interesting of the Abstract Expressionists, if he can even be called that. Who knows? He wasn’t abstract, for one thing. Anyone who looks at the paintings will have to acknowledge that they’re rotten with suggestiveness, deliciously so. It’s interesting to me that you keep Gorky as a reference point. Would you say that’s true? Not as a reference point now, but he’s someone I never forget about. Are you willing to mention artists you do keep as reference points? They all sound too grand, and they’re too long dead. Guston had no qualms about linking himself with Piero della Francesca. No? Well, Stuart Davis, at his best, then. When you consider that he had no support system for what he did. He invented his own lingua franca. I think many American critics – and this may be very chauvinistic – have come to think of Abstract Expressionism as the lingua franca of the second half of the twentieth century, because it appears to manifest its influence in so many places. Do you not have Abstract Expressionism in mind? No. But I’m sure I was very much affected by it. I helped David Sylvester to hang the de Kooning exhibition at Tate in 1995, which was a very educational process, as you can imagine, because you were so near the paintings. One had to make constant, instantly defensible value judgments.’No, David, you can’t hang that there because.’ And he would come back with something that was more like a tidal wave than a sentence. It was wonderful to be so near them. Let’s talk about colour. Is there a satisfactory language to describe colour? Where chances are most obviously taken – sometimes with debatable success and sometimes with triumphant clarity and resolution – they seem to produce the most fraught-feeling aspects of your pictures. Do you decide on a palette before you make a painting? Is there ever a root colour in a picture, on which everything else must hang? No. It is a juggling act every time. That’s why it’s always a struggle. Does colour provide the precision needed for a subject? It can do. But people pretend that I never draw, because they can’t see that my pictures are made of drawing, shape and composition. I’m surprised, because to me the linearity that develops from moving paint around is so pronounced, as are the occlusions. Yes, thank you! That seems to be something I can’t say to people. In An Italian Landscape there is a wonderful sap green running through the picture. The title suggests that it has two meanings. It can mean a painting, or an actual view. It means an actual view. So you had a view in mind, a memory that you worked from? Your paintings have weather in them, which is not true of many contemporary works. They have mood, but not weather. Maybe that’s because I’m an English artist. I hate to say that, because I don’t feel like an English artist at all, but I’m afraid it’s inescapable. Well, there’s no weather in Michael Craig-Martin. But I don’t think of Michael Craig-Martin as an English artist. Do you? I’m not sure I know what you mean by an English artist. Well, I think of Stuart Davis and de Kooning as totally American artists, for example. Well, yes, de Kooning certainly became American and changed what American painting meant, or ‘American-ness in painting’, to use a Greenbergism. Do you think you’ve done the same thing for Englishness in painting, or is there no such thing? I hope there’s no such thing. The issue of weather brings me back to the question of these paintings as reflections of yourself. I’m sure some people are tempted to read your evocations of weather as evocations of psychological weather. Yes, they might. I can’t stop them. Is there a correspondence, then? Have there been paintings that have grown out of specific moods that you’ve wished to sustain? Oh, mostly, yes. Far more than anything else. Do you think the durability of a painting as an achieved physical object, if it’s well-tuned, will secure the persistence of the mood? Yes, I do. And I’m not just speaking of my work. I think if a painting succeeds, it’s there and it won’t evaporate. You can use the most evanescent mood to make something solid. This suggests to me that what you’re saying is that the painting process is part of defining the moods that you have. Can moods be among the subjects in your sphere? And can you think of other things, besides weather, that qualify as subjects? Well, weather’s never been a specific subject. There’s a big picture in the Tate collection called Rain, but it includes a lot of other things. So is a painting a receptacle in that sense? That seems to invite dangerous projections on the viewer’s part. Yes it does, but viewers usually don’t make mistakes. I’m just astounded by that. Are there subjects that have defeated you? I can’t remember one that I never finally conquered. I can remember ages ago that I felt I’d failed to communicate when I’d painted some unhappy emotional situation and someone looked at the picture and said: ‘Oh, how pretty; how charming.’ And I thought ‘ugh’. But then, why not? Why shouldn’t they? The picture should be itself. So you do see your work as communicative? Yes. And the pictures do communicate. I think that too remains a point of ambiguity, or it seems to fluctuate in degrees among the paintings. Yes, of course it would among anybody’s paintings. It fluctuates vividly among yours, I think. I don’t mind being vivid. …in that some do seem to be very private and others quite public. Yes, though to me they always seem ridiculously open. But I think that’s because of the nature of how an artist works, at least how I work. Do you have a favourite register in which to work, where you’re most comfortable? No, not at all. But I’m always fascinated by the effect of scale and surface on the emotion that one is trying to communicate. Sometimes I make them bigger. Yes. I can’t remember ever having made one smaller. What about your sense of your audience? Are there other painters you try things out on? No. No one. I used to. My only painter friend was Patrick Caulfield, who died recently. Now it has to be me. Do you paint in silence? According to Hodgkin, View from Venice 1984–5 is a view from the city into the Lagoon. A few swathes of turquoise, orange, black and white, some dashes of red-brown burnt sienna, and some tiny remnants of the initial bare wood surface represent the memory of what he saw and felt with this view before him. But the painting is sufficiently indistinct to act as a trigger for the viewer’s own recollections and, perhaps, emotions. For me, it conjures up memories of looking across the Lagoon at sunset to surrounding islands like the cemetery San Michele or Murano, when they glow a pinkish-orange and hover over the water like an apparition, or watching the sun setting spectacularly behind the ugly Tronchetto car park and the industrial area to the west of the city. The central, illusory image is enclosed by a border made from three individual wooden frames, painted in autumnal ochre, earthy green and red, and covered by black spots. This dense frame could represent an interior space, one of those intensely patterned, ornate Venetian rooms, from whose window, perhaps, Hodgkin experienced the view. It is often said that in the city’s shifting and dramatic light, its reflections, mists and sunsets, Turner found a perfect echo of his sensibilities, and the ultimate motifs from which to show off his talents. The same can be said of Hodgkin. His practice is solitary. ‘Alone in my studio’, he has said. ‘I long to share my feelings’. And his depiction of Venice, the ghostly shadow of a once thriving republic, is inevitably a kind of elegy. Hodgkin once lamented that it was ‘irritating.to be constantly told that my pictures are beautiful’, because it might indicate that they lack meaning or content. However View from Venice for all its exuberant colour, energy and expressive vigour, contains a hint of sadness. Like Venice, it is indeed beautiful, but it is a beauty with a lingering melancholy. 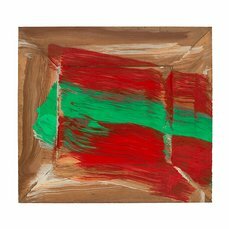 Shop online for this beautiful silk screen limited edition print, by Sir Howard Hodgkin, one of Britain’s most distinguished painters and printmakers. Limited edition of 75.